Stephen Colbert is a writer, a comedian, and an actor. Colbert is a self-proclaimed liberal, but also reportedly a Democrat Catholic and a Sunday school teacher. Colbert is an ex-atheist. Colbert replaced David Letterman as the host of CBS's late night program on September 9, 2015, featuring "six solid minutes bashing Donald Trump but not a single joke about Hillary Clinton’s email scandal or crazy Socialist Bernie Sanders." Not surprisingly, his ratings then collapsed for his show the following night, particularly in the key demographic of younger viewers. His show The Colbert Report gained credibility by featuring Conservapedia on December 8, 2009, including an interview of Andy Schlafly in his studio. Apparently pleased with the popularity and quality of the segment, Colbert selected and featured the same episode as a subsequent rerun. The show had previously mentioned Conservapedia on prior occasions. Some Colbert fans responded to the references to Conservapedia by attempting to vandalize the site. Colbert began his career at Comedy Central in the year 2000 on the show Strangers with Candy. He later left in order to become a correspondent on The Daily Show with Jon Stewart, where he began to build what would later be the character he would play on The Colbert Report. He was well-regarded on the show and occasionally guest-hosted for Stewart. Due to his work on The Daily Show, he won three Emmy Awards and two Peabody Awards along with the other writers. On October 21, 2008, Patrick Henry College chancellor, Michael Farris, presented Colbert with the honorary title of Arbiter of American Morality and Defender of the Vast Right-Wing Conspiracy. The Colbert Report ended on December 18, 2014 as Colbert was slated to replace David Letterman as the host of the Late Show on CBS beginning September 8, 2015. Colbert hosts the show as himself and the Colbert character will presumably be retired with the end of the Report. On May 10, shortly after he received word that FBI Director James Comey had been fired by President Donald Trump, he proceeded to correct his audience and imply they were all Trump supporters when they cheered at the news. The Colbert Report (pronounced Col-bear Re-pore) was a late night satirical program hosted by liberal Christian Stephen Colbert on Comedy Central. The show was hosted by the character Stephen Colbert, a news anchor who makes many of his jokes parodying conservatives and conservative values. It first aired on October 17, 2005 as an spinoff of The Daily Show. Stone Phillips was the first guest. Colbert played a character who shares his name. Colbert's character was a liberal stereotype of a conservative pundit, particularly a mockery of Fox News host Bill O'Reilly and The O'Reilly Factor. Colbert has a guest every episode on the last segment, including authors, activists, and occasionally politicians and political personalities. He has said that his personality was based on O'Reilly, Anderson Cooper, and Geraldo Rivera. Colbert's interviews were short and almost never serious, where Colbert's character often jokes around and never to the point, making often unrelated jokes and random obvious fallacies. Colbert was famous for coining words, most notably truthiness, which states facts are meaningless and one should trust his gut, which was coined to mock conservatives by saying they are unintelligent or unlearned. Colbert has also used the show to condone vandalism on Wikipedia® and Conservapedia on several occasions. A book, I Am America (And So Can You!) was written by Colbert and his writers in the persona of his character in which conservative values are mocked, and the book is an extension of Colbert's character. A Better Know a District segment of The Report had Colbert interview a congressman on the show, and Colbert has had a disproportionate showing by party, having significantly more Democrats than Republicans on the show. The interviews, which are pre-recorded, are later edited to cast the interviewee in a poor light. For example, a congressman's answer to a question might be made to appear as though in reply to a totally different question, making the answer, and by extension the congressman, appear ridiculous, immoral, biased or ignorant. Another technique used in these interviews is Colbert's asking of loaded questions, such as his famous "George Bush- great president or the greatest president?" The Colbert Report had a following which the Colbert character often used for his various pranks. 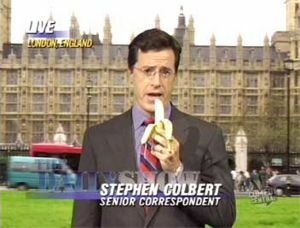 For example, in every public vote for naming something, Colbert urges his fans to vote for him. He also leads frivolous wiki-vandalizing campaigns, having requested viewers vandalize Wikipedia several times and Conservapedia (see Relationship with Conservapedia section later in the article). In his recurring segment "The Wørd", which is a parody of O'Reilly's "Talking Points", Colbert coined the word truthiness on the show's pilot, which refers to the quality possessed by statements which, though factually false, are repeated by supporters who feel in their hearts that they ought to be true, and regard it as quibbling to object to their falsehood. Colbert has poked fun at Wikipedia and its apparent democratization of truth. He has coined the word "Wikiality" (as opposed to "reality") and caused trouble for Wikipedia by suggesting that his viewers alter articles. In August 2006, he encouraged users to state that the population of African elephants had tripled in the last decade. Colbert's point was that if enough people believe something, it becomes "the truth". Wikipedia responded by reverting and locking down the pages to prevent further vandalism in response to Colbert's requests. Colbert had viewers write in his name to a public vote done by NASA to name a new room addition to the International Space Station. Colbert's cult-like followers won the contest for him with an astonishing 230,539 total votes, 40,000 more than NASA's choice of Serenity. To resolve the issue, NASA named a treadmill on the space station after Colbert instead of the room. In September 2010, Colbert testified in character before Congress. Colbert "ran" for President in the South Carolina primary in 2008. In 2012, the South Carolina primary ballot had been finalized before Herman Cain dropped out of the race and before Colbert could announce his candidacy. So, Cain and Colbert agreed that Cain would be Colbert's surrogate, and they campaigned jointly in South Carolina delivering the message that a vote for Cain would be a vote for Colbert. On January 21, "Cain/Colbert" received over 6,000 votes, a fifth-place finish. Colbert founded the Colbert Super PAC, which was designed to make fun of the Citizens United ruling. The Super PAC's ads made fun of former Republican candidate Rick Perry, and the negative ads about Mitt Romney. During Colbert's 2012 campaign, he was required to transfer control of his Super PAC, which he handed over to Jon Stewart. Ultimately, the Super PAC's unused funds were donated to charity. The last episode aired on December 18, 2014. On May 1, Colbert received much criticism for saying a homosexual-themed joke against U.S. President Donald Trump. Despite the vulgarity of the comment, the Federal Communications Commission chose not to fine him. ↑ "The Colbert Report (December 8, 2009 episode)". The Colbert Report. 2009-12-08. ↑ "The Colbert Report (October 7, 2009 episode)". The Colbert Report. 2009-10-07. ↑ The Colbert Report: Michael Farris (October 21, 2008). Retrieved on January 8, 2015. ↑ http://thecolbertreport.cc.com/full-episodes/jnv7om/october-17--2005---stone-phillips Retrieved December 24, 2014. ↑ Rama, Padmananda. "Herman Cain Gets 'A Colbert Bump' In South Carolina", NPR, January 21, 2012. Retrieved on January 8, 2015. ↑ The Colbert Report (December 13, 2012). Retrieved on January 8, 2015. ↑ http://thecolbertreport.cc.com/full-episodes/q0f0hx/december-18--2014---grimmy Retrieved December 24, 2014. ↑ Blake, Andrew (May 24, 2017). FCC won’t discipline Stephen Colbert over Trump-Putin joke. The Washington Times. Retrieved May 24, 2017. This page was last modified on 9 April 2019, at 16:58. This page has been accessed 238,721 times.